Sidney senior forward Ratez Roberts dunks during a nonconference game on Feb. 2 in St. Marys. Roberts is one of 23 area players that will play in District Nine all-star games on Thursday and Friday in Troy. Sidney senior guard Andre Gordon drives past Troy’s Caleb Fogarty during a Greater Western Ohio Conference game on Feb. 1 in Sidney. Gordon, a Virginia Tech commit, will play in the Div. I, II, III District Nine all-star game on Friday at 8 p.m. in Troy. Sidney fans who want to see senior stars Andre Gordon and Ratez Roberts in Sidney uniforms one last time will be able to on Friday in Troy. Gordon and Roberts are among many area boys and girls basketball seniors that will play in the Ohio High School Basketball Coaches Association’s District Nine all-star games on Thursday and Friday at Troy High School’s Trojan Activities Center. Gordon and Roberts will play in the Divisions I, II, III boys all-star game at 8 p.m. on Friday. The Div. I, II, III girls game will kick off the evening at 6:30. The girls Div. IV all-star game will be Thursday at 6:30 p.m. and the boys will follow at 8. Proceeds from the games will benefit Dayton Children’s Hospital. 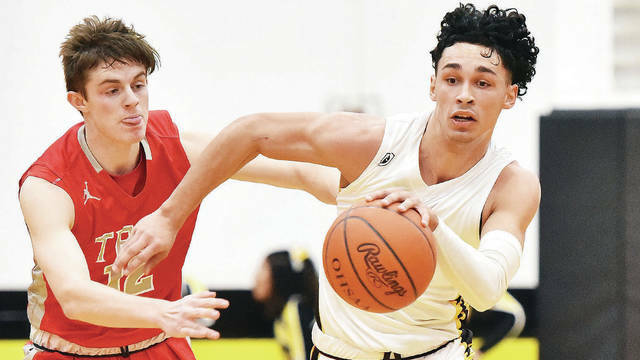 The all-star games feature top seniors from the OHSBCA’s District Nine, which covers all or parts of Clark, Champaign, Darke, Greene, Logan, Miami and Shelby County. 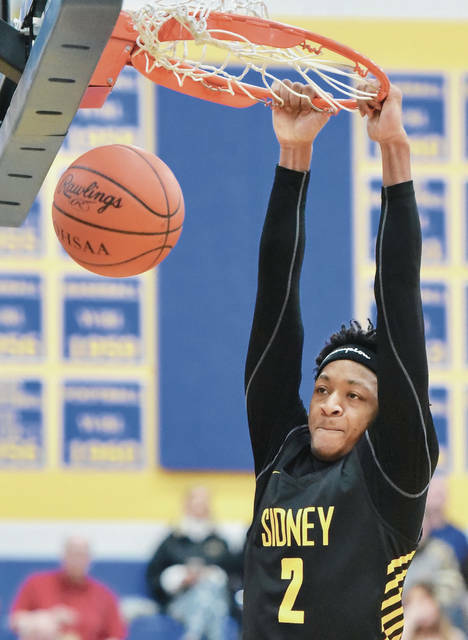 Gordon averaged 23.9 points, 5.5 assists and 5.4 rebounds per game while Roberts averaged 9.8 points and 4.3 blocks this season for Sidney, which finished 20-5. The duo are among four area players that will play for the North squad. Anna’s Griffin Doseck and Versailles’ Evan Hiestand will also play for the team. Anna coach Nate Barhorst and Versailles coach Travis Swank will coach the squad. Versailles’ Kelsey Custenborder and Elizabeth Ording will play for the girls North squad while coach Jacki Stonebraker will join Miami East’s Bruce Vanover in coaching the team. Numerous area players will play in the D-IV games on Thursday. Russia’s Jordan York and Daniel Kearns and Lehman Catholic’s Bryce Kennedy will play for the West squad in the D-IV boys game on Thursday while Jackson Center’s Trent Platfoot, Botkins’ Spencer Heuker and Riverside’s Lane Willoby will play for the East team. Jackson Center coach Scott Elchert is one of two coaches who will guide the East squad. Russia’s Laurissa Poling and Jenna Cordonnier, Houston’s Hayden Riesenbeck and Jess Monnier, Fairlawn’s Kennedy Spicer and Lauren Dudgeon, Lehman Catholic’s Grace Monnin and Carly Edwards, Botkins’ Taira Greve and Riverside’s Shelby Giles and Dana Jones will play for the D-IV girls East team. Fort Loramie coach Carla Siegel and Riverside coach Bryce Hodge will coach the team. It will be the first of two all-star games for Gordon in the coming weeks. Gordon, a Virginia Tech commit, will also play in the Ohio vs. Kentucky all-star game on April 13 at Thomas More College in Crestview Hills, Kentucky. Gordon was selected as District Nine’s Div. I player of the year. He was also named first team all-Ohio in D-I last week. Thursday, March 28, 6:30 p.m.
East: Hayden Riesenbeck (Houston), Dana Jones (Riverside), Taira Greve (Botkins), Kennedy Spicer (Fairlawn), Lauren Dudgeon (Fairlawn), Grace Monnin (Lehman Catholic), Carly Edwards (Lehman Catholic), Jess Monnier (Houston), Shelby Giles (Riverside), Laurissa Poling (Russia), Jenna Cordonnier (Russia), Emma Printz (Tri-Village). West: Bianca Keener (Bradford), Elly Shipfer (Mechanicsburg), Leslie Flores (Southeastern), Trinity Henderson (Ansonia), Jalyn Forrer (Troy Christian), Cara Salazar (Troy Christian), Samantha Whiteman (Covington), Lillian Hamilton (Covington), Maggie Coe (Cedarville), Kayla Cyphers (Cedarville), Mackenzie Cauley (Triad), Kristin Bailey (Triad). Thursday, March 28, 8 p.m.
East: Trent Platfoot (Jackson Center), Sabien Doolittle (Catholic Central), Trey Dunn (Catholic Central), Jackson Kremer (Troy Christian), Connor Case (Troy Christian), Lane Willoby (Riverside), Chris Taylor (Mechanicsburg), Joey Mascadri (Mechanicsburg), Charlie Bertemes (Southeastern), Owen Flannery (Southeastern), Adonia Davis (Emmanuel Christian), Spencer Heuker (Botkins). West: Jordan York (Russia), Daniel Kearns (Russia), Ryan Mollette (Newton), Chet Jamison (Newton), Bryce Kennedy (Lehman Catholic), Derek Eyer (Tri-Village), Hunter Muir (Ansonia), Andrew Rowland (Ansonia), DJ Howell (Mississinawa Valley), Trent Collins (Mississinawa Valley), Ethan Conley (Franklin-Monroe), Connor Crist (Franklin-Monroe). North: Lauren McGraw (Troy), Tyree Fletcher (Butler), Abbie Schoenherr (Butler), Klaudia Lowery (Bethel), Jada Garland (Greenville), Izzy Kidwell (Piqua), Breah Kuck (Anna), Morgan Haney (Miami East), Maria Staton (Miami East), Kelsey Custenborder (Versailles), Elizabeth Ording (Versailles), Kristen Dickison (Milton-Union). South: Macy Berner (Tecumseh), Mackenzie Pauley (Tecumseh), Mariah Baker (Kenton Ridge), Trinity Morton-Nooks (Springfield), Pamela Kelly (Benjamin Logan), Olivia Roose (Benjamin Logan), Kenzie Harding (Greeneview), Caitlin Sweat (Greeneview), Abby Grieser (Northwestern), Paige Shafer (West Liberty-Salem), Aliana Lyons (Urbana), Paree Furness (Shawnee). North: Griffin Doseck (Anna), Evan Hiestand (Versailles), Andre Gordon (Sidney), Ratez Roberts (Sidney), Jack Clement (Bellefontaine), Qurri Tucker (Piqua), Caillou Monroe (Troy), Noah Walker (Greenville), Brevan King (Graham), Chase Adams (Graham), Kendall James (Bethel), Will Hudson (Miami East). South: Michael Kreill (Butler), Brandon Norman (Butler), Cole James (Benjamin Logan), Nolan Robson (Benjamin Logan), RaHeim Moss (Springfield), David Sanford (Springfield), DJ Hayden (Shawnee), Evan Noffke (Northwestern), Randy Collins (Tecumseh), Noach Crawford (Xenia), Samari Curtis (Xenia), Reid Taylor (Urbana). This entry was tagged all star game, all stars, all-star, coaches, coaches association, District 9, District Nine, game, games, ohio, Ohio High School Basketball Coaches Association, OHSBCA, roster, rosters, Troy. Bookmark the permalink.